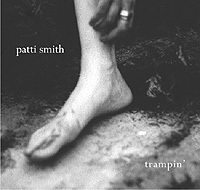 Patti Smith, never one to beat around the bush, lays it out on “Jubilee,” Trampin’s opening song: “Who dreams of joy and radiance? Who dreams of war and sacrifice?” Thought influences deed, how do you think? The importance of each and every one of our answers to that question pervades Trampin’. “Gandhi” reminds us that its subject was like any of us–he had a mother and was afraid of the dark as a child–and advises “hit them with the numbers,” which, the song points out, can grow from a one to millions with stunning rapidity. There’s also “Peaceable Kingdom,” whose gentle refrain “maybe one day we’ll be strong enough to build it back again/build a peaceable kingdom” points out that achieving peace takes greater strength than going to war. But it’s not all politics. Smith is 57 now, older and wiser. She offers what life lessons she can in “Cash” and looks back at decisions past and mistakes made in the stunningly beautiful “Trespasses.” Age has not affected her performance, and whether it’s a soft endearment or an infuriated scream, the expressive power of her voice hasn’t waned in thirty years. It runs the gamut on Radio Baghdad, less a song than an explosive poetry performance, and the heart of the album. Smith reminds us that Baghdad was once the center of the world, the place where the zero was invented, and the location where the events of the bible so often thumped by pro-war advocates took place. She admonishes “suffer not your neighbor’s afflictions. . .lest you vanish in the city and leave not a trace.” History is a wheel, and if you don’t take that into consideration, it will run you over. And of course there is the human toll, a mother screaming for her child to run, while bombs fall as part of “Shock and Awe, like some crazy TV show.” The operation name represented a triumph for the military and a joke to left wingers, but Smith reminds us that it’s dead serious, and no matter what you name it, it means people getting blown up. Patti Smith is counted as one of the founders of punk, but she has never given in to nihilism or despair. The idea that peace, love, and hope are not incompatible with strength and maturation has always been important to her. And so it is appropriate that Trampin’ ends with its title cut, a cover of a Marian Anderson hymn with Smith’s daughter playing piano. “I’m trampin’, trampin’, trying to make Heaven my home.” Amen. The CD can be found just about anywhere music is sold.